The more we study living things, the more interesting things we find they can do. Case in point, a recent research paper in the journal Environmental Microbiology showing that a group of microbes have turned rare-earth metals to their advantage—not just tolerating them, but staking their lifestyle on them. The rare earth elements (REEs) are a group of a dozen or so elements, called the lanthanides, that take up a whole bottom row of the periodic table. The REEs are chemically so similar to each other that some of them couldn't be separated for commercial production until just a few decades ago. Today we prize them in high-tech magnets and electronics, and REE ores are strategic commodities, currently monopolized by sources in China. 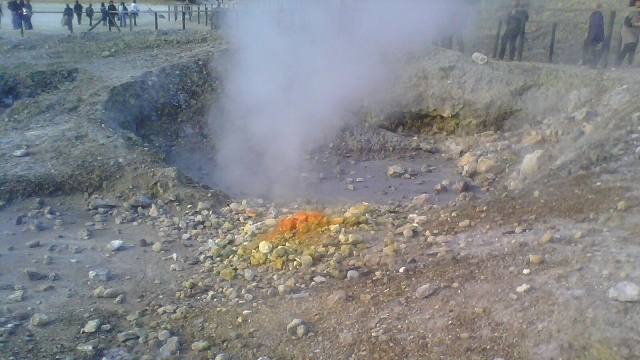 The paper, by a Dutch-German group, reported on a study of a methane-eating microbe from a pool of scalding acid mud in the Solfatara volcanic crater near Naples, Italy. The researchers, led by Huud Op den Camp of Radboud University in the Netherlands, couldn't make Methylacidiphilum fumariolicum thrive in the lab without mud from the Solfatara mudpot. Even in its preferred setting of pH around 3 and 60°C, without its hometown mud the bacterium just sat there. The missing nutrient wasn't calcium, which other methane-eaters use in a key methane-digesting enzyme. Using x-ray crystallography, the team determined that M. fumariolicum's enzyme had a structure requiring some metal atom that was slightly larger than calcium. For six years, the team tried one trace element after another; Op den Camp was even bringing in vitamins and other stuff from home. The microbes finally lit up when REEs were added to their feed. M. fumariolicum loved cerium most of all, but lanthanum, praseodymium and neodymium did the job too. Given rare earths, it could grow in tap water and didn't need the rest of the mud. All of this—REEs, in effect, being vitamins—was unheard-of. But it fits with some other things we know about life and about the lanthanides. About life, we know that it is not designed perfectly, but evolves under pressure to work well enough to survive. Microbes that eat methane rely on the enzyme methanol dehydrogenase, which includes a well-placed atom of calcium. But life is flexible. We know that amylase, another calcium-dependent enzyme used to break down starches, can work at partial efficiency with rare-earth atoms, like a diesel engine that can run on vegetable oil if it has to. If calcium is absent for some reason, amylase can stagger along on rare earths. If methanol dehydrogenase works similarly it's easy to postulate M. fumariolicum, in the extreme setting of its lanthanide-rich volcanic mudpot, evolving an enzyme better tuned for the substitute metals and gaining enough of an edge for the adaptation to stick. About the rare earths, we know that they got the name "rare," despite being more abundant than copper and zinc in the continental crust, because they tend not to form their own special minerals. Instead, REEs occur tucked into phosphate minerals and titanium minerals as well as clays. They're widespread in trace amounts, but almost never found in high concentrations. Some nitrogen-fixing bacteria benefit from them. Adding them to deficient soils has been shown to help plants acquire nutrients like phosphorus, and some soil bacteria collect them—indeed, these microbes can be used for "green refining" of rare earths. Clearly lanthanides and life have a subtle ongoing relationship. The mudpot microbes are our first example of a species that's best-friends-forever with rare earths and can't live without them. The same gene behind M. fumariolicum's enzyme occurs in many other bacteria. Once we start routinely adding "vitamin REE" to our microbial lab cultures, we'll find more examples we've been missing this whole time.